Smoking is injurious to health is common to hear and read and even it is 100% true but many of us are not aware of the fact that smoking is also injurious to our hair. Yes, it is really true that there is a significant and consistent link between the hair and smoking as per the research comes from the National Institutes of Health. To claim the relationship between smoking and hair health several studies were conducted but the most important study was conducted on the 740 men in Taiwan. In this sample size of 740 men, age was taken 40-91. In Taiwan men who use to smoke more than 20 cigarettes a day were victims of hair thinning despite their family history. In the study, it was observed that men smoke more were more prone to hair loss and even this hair loss was progressive after choosing the hair loss treatment, as smoking even hinders the treatment process. Furthermore the studies explained that cigarette contains the thousands of chemicals and toxins that the smokers inhale while smoking cigarette and inhaling of these harmful chemicals affects adversely to the blood circulation of entire body so even disturb the supply of oxygen as a result of which hair follicles could not get their nutrition so the hair growth gets disturbed. Even these toxins create the free radicals that cause the premature aging and many diseases that affect the hair growth cycle. Thus this study gave clear evidence of a connection between smoking and hair loss. Even smoking can reduce the immunity of the person means it affects the ability of a person to fight with diseases as a result of which smokers become prone to many types of diseases. This illness and aging are not good for hair health and even speedy aging process can turn the hair grey. Even the researches have proved that hair follicles being mini organ so are greatly affected by the internal triggers like diseases, hormonal imbalance so it is obvious that these follicles get affected because of the adverse effects of the smoking. What Occurs To Hair Follicles Due To Smoking? Smoking can deplete the collagen of the skin and even cause dehydrating to the hair as a result of which hair growth and quality get affected. Smoking can directly affect to endocrine system of the body so disturb the gland’s ability to secrete the healthy hormones as a result of which hormone level of the person’s body get disturbed and it affects the hair. 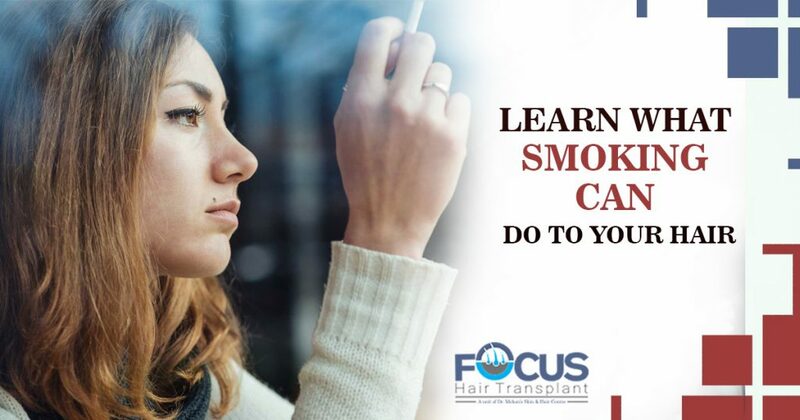 Thus smoking is really not good for overall health and hair growth so you should quit smoking and seek effective hair fall treatment so that you could restore your hair and good looks. If you have complete baldness or large bald patches then hair transplant can give you the permanent solution but to be a good candidate for this procedure you need to say no to smokin.